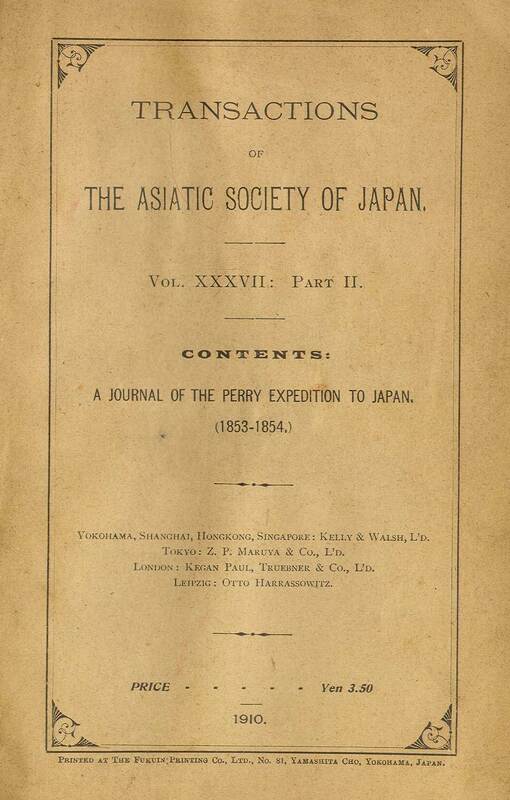 A Journal of the Perry Expedition to Japan (1853-4), Yokohama, 1910, Transactions of the Asiatic Society of Japan (TASJ), Volume XXXVII, Part II, published by Kelly & Walsh, Ltd, printed by the Fukuin Printing Co., 8vo, black and white tissue guard protected collotype frontispiece (portrait of Perry), color chromolithograph plate depicting Dr. S. Wells Williams as drawn by a Japanese artist, 2 other black and white collotype plates of drawings/paintings ("Perry Landing at Kurihama, 14 July, 1853" and "View of Yokohama Harbor when Perry Was First Sighted"), 9 page "Prefatory Note (i-ix), 263 pp. 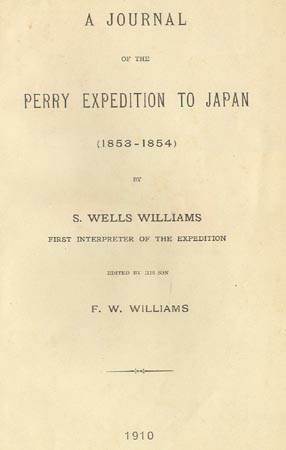 Williams was the official translator for the Commodore Perry during the Expedition to Japan. In this very critical position, he observed all the major events that occurred as the Japan expedition progressed. This is his personal journal recorded on a day by day basis. The journal covers 1853-54. 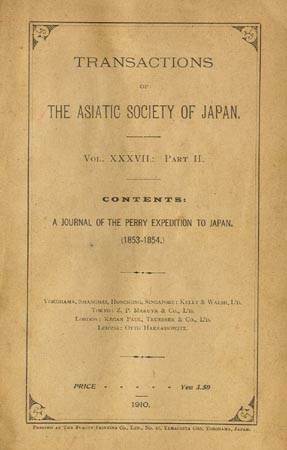 It was made available to the Asiatic Society of Japan by his son, F. W. Williams. Considered by many to be the most important contemporary journal published by a member of the expedition. More than one third of the journal relates to activities on Okinawa. 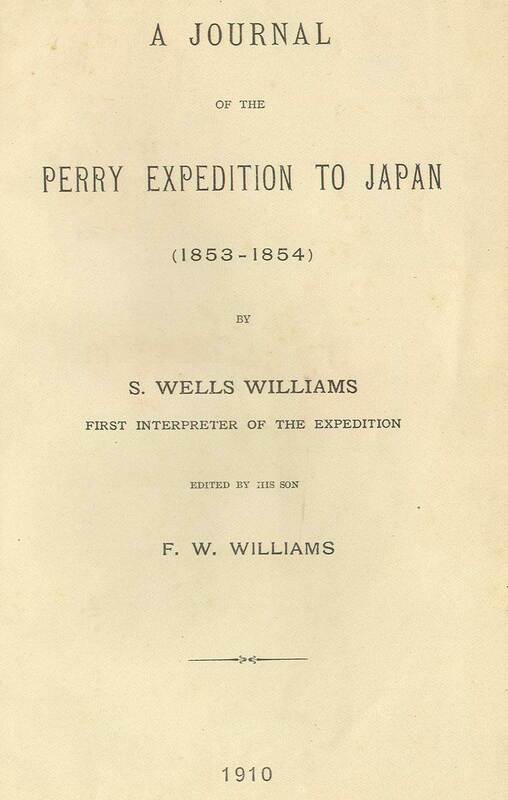 Dr. Williams was noted expert on China and Asia and was personally selected by Commodore Perry to serve as his interpreter on the expedition to Japan. Williams was a keen observer and had an understanding of Japanese culture. His day to day record of events, is no doubt, the most complete and accurate record of the expedition outside the actual Government published narrative of the expedition. This journal is an invaluable supplement to the Government narrative as Williams did not hesitate to describe and characterize the events unfolding, even when they were unflattering to the Americans. Kelly and Walsh is the first publisher listed on the title page of the TASJ. The following publishers/agents are also listed: Tokyo: Z.P. Maruya Co., Ltd, London: Kegan Paul, Truebner & Co., Ltd and Leipzig: Otto Harrassowitz. For a photograph and biography of Samuel Wells Williams published the Far East, December of 1876, click here. Bindings. I believe that this journal was originally published in paper wraps as was the norm for issues of TASJ. However, it is rarely found in that format. It is generally found bound. All the bound copies I have examined (and it is not that many) were clearly bound privately years after the paper wraps version was issued. The bound books I have examined generally did not retain the paper wrap cover from the actual TASJ issue. They would start with the title page for the journal. A bound copy has been examined which contains the front cover, a list of society officers (back of front cover), a single page of notes regarding the Society meeting of June 16, 1910 and then the Williams Journal which ends on page 259. Some bound volumes contain page 260 which is blank and pages 261-3 which contain more notes/comments from the Society meeting of June 16. 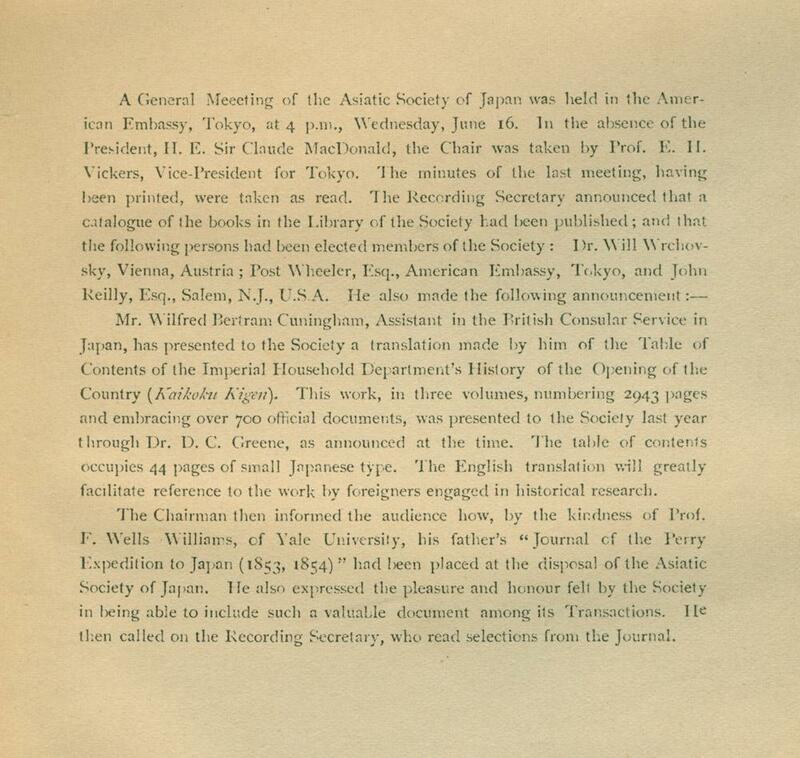 One bound volume examined contains a note regarding the TASJ General Meeting of Wednesday, June 16 (1910) on a page before the title page. A comment regarding scarcity. The complete Williams Journal as originally published in TASJ is, in my experience, very scarce. It is rarely found with the original front paper wrap of the TASJ. I have seen a comment that the Journal was published in 1856 but find nothing to support this. Dr. Williams and the White Flag Controversy. Controversy still swirls around Perry's presentation of the President's letter. 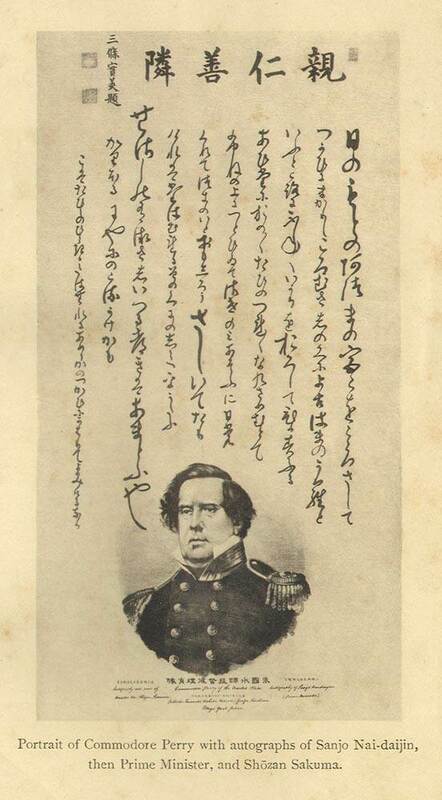 It is known that in addition to the President's letter, Commodore Perry presented letters he had written. This is not disputed. However, in a recent junior high school textbook in Japan, it is asserted that Perry presented a letter and a white flag(s), threatening attack if the Japanese did not allow trade. Raising the white flag would be a signal to Perry that trade would be allowed. The historical support for this assertion is currently questioned and this has opened an academic debate know as the "White Flag" controversy. The support for this assertion appears to be founded only on a Japanese account of the letter (not the actual letter itself). Apparently the actual letter has not been produced nor is there a record of it in US historical records or documents. 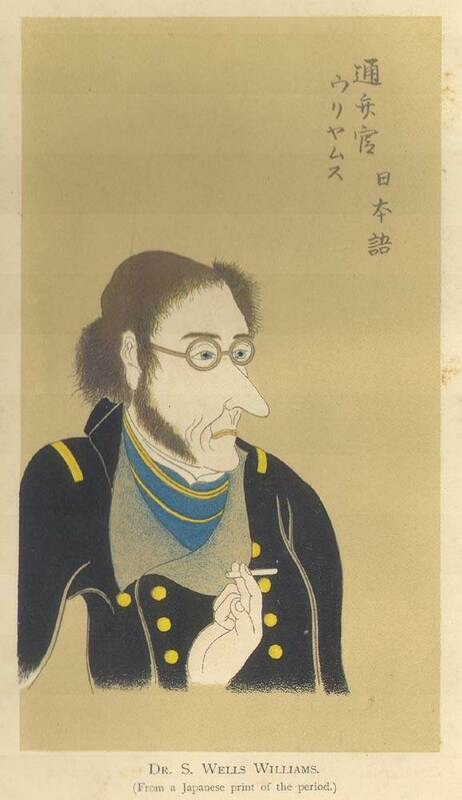 The "White Flag" letter is set forth in Meiji Japan through Contemporary Sources, 1844-1882, Volume 2, 1844-1882 (more information here), which was compiled and published by the Centre for East Asian Cultural Studies, The Toyo Bunko, Japan. The letter from Perry dated July 14, 1853 allegedly stated "If in such situation you seek for a reconciliation, you should put up the white flag that we have recently presented to you, and we would accordingly stop firing and conclude peace with you...." (Item No. II-C which is attributed to a 1910 publication). 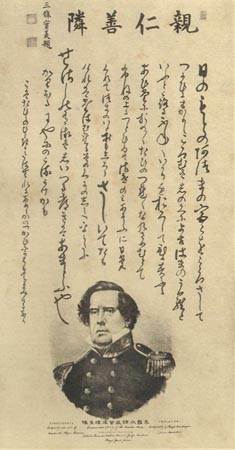 The same book presents a letter by Tokugawa Nariaki dated August 7, 1853. 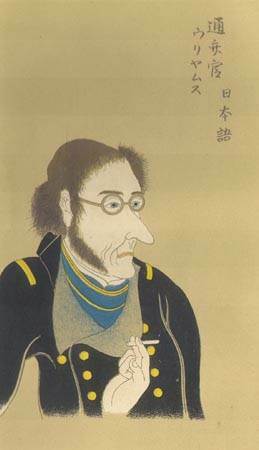 Nariaki was a staunch advocate of resisting, by military force if necessary, the American requests. In his letter Nariaki observed "The American barbarians who came this time were fully cognizant of our prohibitions, yet they arrived at Uranga, presented a white flag to signify the will to conclude peace, forcibly offered a request [for trade]...." (Item No II-E). Nariaki's account of the white flag is probably the most accurate. In his work titled "Passing the Rubicon," Wilhelm Heine depicts an American survey boat with a large white flag at the bow. This was during the period just prior to the first landing and presentation of the President's letter. Perhaps during the first landing a white flag was similarly shown (displayed) in order to demonstrate that the military forces landing did so with peaceful intentions. 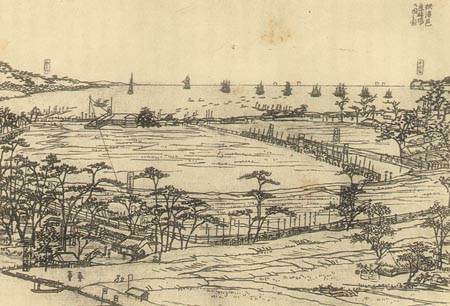 The letter dated July 7, 1853 from Commodore Perry is reproduced in the Narrative. However, this is not the "White Flag" letter. Dr. Williams was the expeditions "first interpreter" and the man that Perry hand picked to be his advisor and interpreter. You would expect that he would be aware of the "White Flag" letter. You would expect that such a letter would have been mentioned or recorded by Williams. 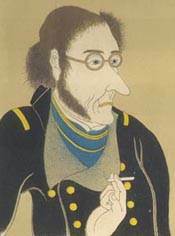 It was not despite the fact that in this private journal, Williams was often critical of Commodore Perry and the American tactics in general. In the negotiations regarding the receiving of the President's letter one reference is made to a "white flag." In my opinion, this comment by Dr. William's does not support or buttress the basic proposition of the "White Flag" controversy. 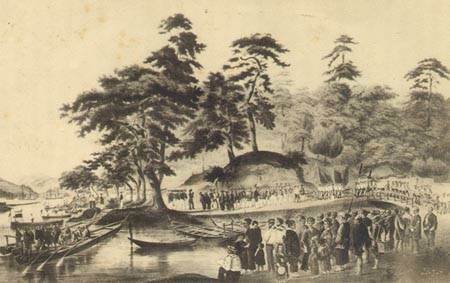 Just a few days later American survey boats were to be in Uraga bay under a white flag and it would seem reasonable to ensure that the Japanese understood the significance of the white flag. It does not seem reasonable that in the same sentence Williams would note the Japanese were admonished not to visit the ships too early in the morning and, by the way, if you don't show us a white flag we will unleash a major military attack. 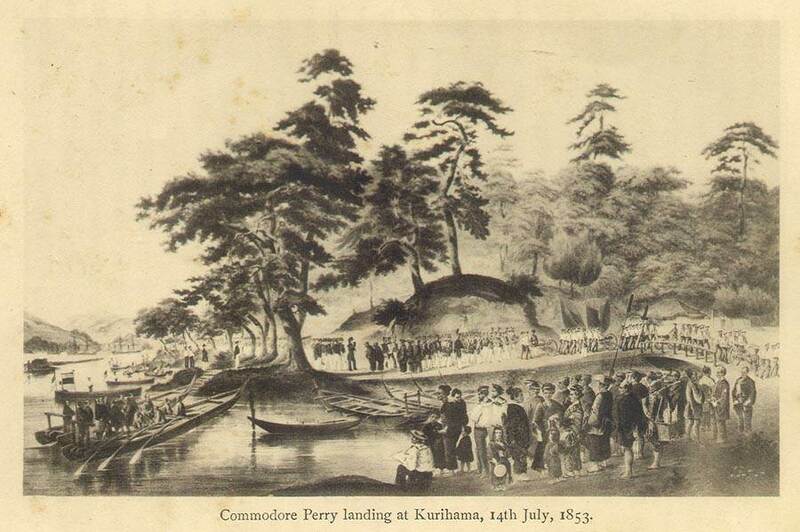 Frontispiece - Precedes the "Prefatory Note"
After page ix, Follows the "Prefatory Note"
Commodore Perry's Landing at Kurahama, 14th July, 1853.
his Farewell Visit to the Imperial Commissioners at Simoda." 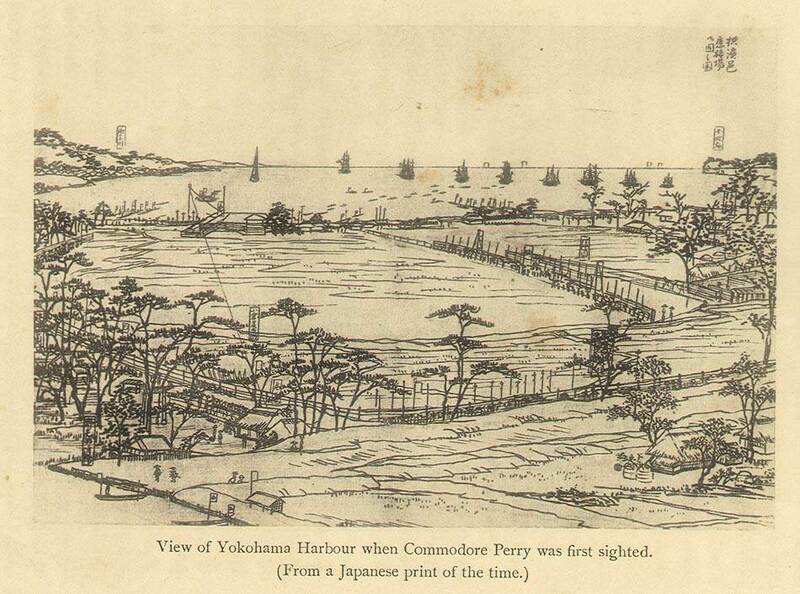 View of Yokohama Harbour when Commodore Perry was first sighted.